All author proceeds from this book will be used to help the people of the Fylde and West Lancashire fight against fracking. In the first volume of Fracking The UK, Alan Tootill discussed the threat to Britain of a new dash for gas. It concluded that the US experience shows the UK government's imposition of shale gas exploration on an unwilling public is ill-judged and unacceptable. Published in March 2013, this remains an essential primer to fracking and how it might affect the UK. 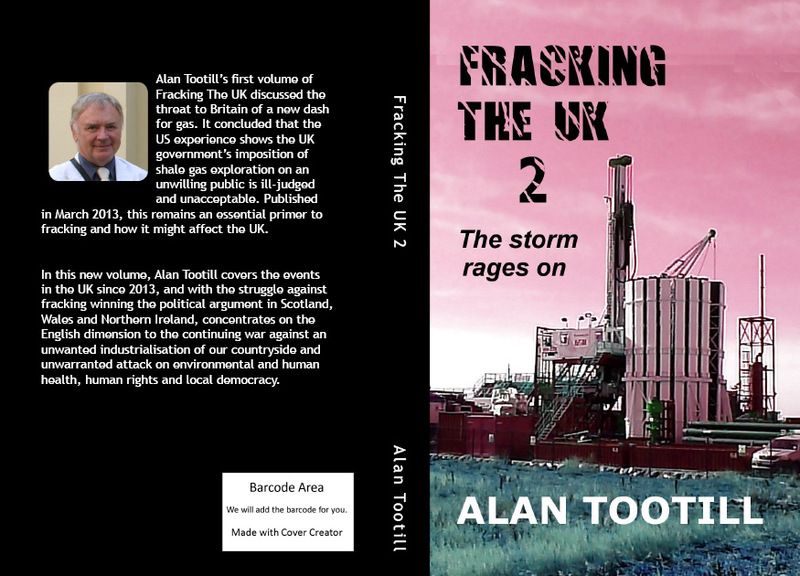 The new volume, Fracking The UK 2 - The Storm Rages On, covers events in the UK since 2013, up to December 2016. It reports on new developments in the US and emerging information about the hazards of fracking, with reference to how this fits in with the UK government's pro-fracking climate. Political, industry and social developments in the UK are charted, with special emphasis on England, where the UK government is intent on inflicting fracking on an unwilling public. 2 Earthquake Risk - Are injection wells allowed in the UK? 3 Earthquake risk - just damaged homes? 7 Climate Change UK - The Greenest Government Ever?